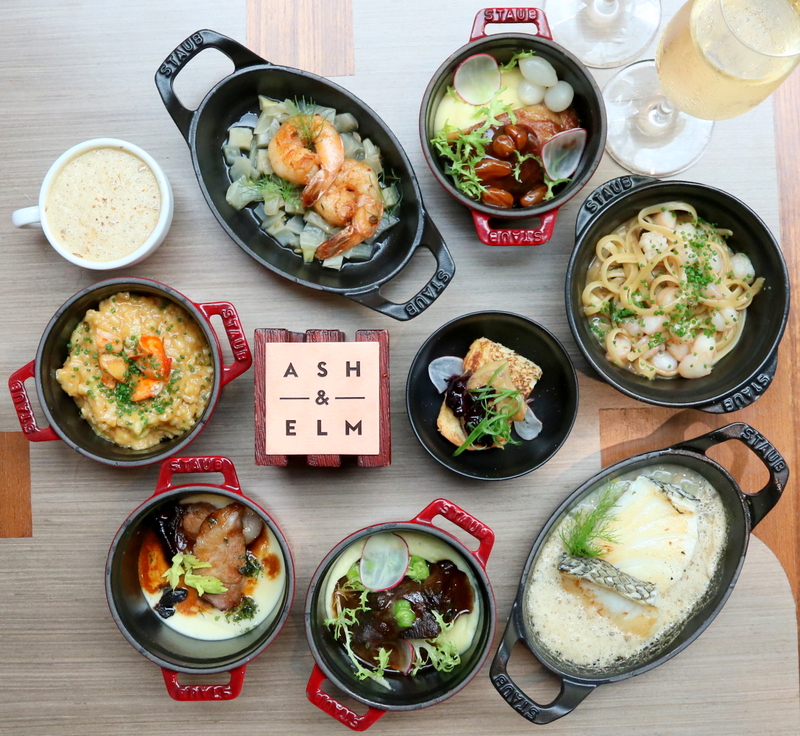 The Place Located at the lobby level of InterContinental Singapore, Ash & Elm took is a spanking new European restaurant concept, which took over the now defunct Olive Tree. The first thing which I like about the design is the translucent pearl white ceiling, where you get some kind of shaded natural light casting into the main section of the 100 seater restaurant. The design of Ash & Elm cleverly uses partitions well to create the much need dining privacy, with plush leather seats for maximum comfort. The Food The restaurant recently introduced its new Sunday Brunch buffet, with a focus on small plates prepared a la minute. Choose from an unlimited selection of Chargrilled Iberico Pork Loin, Chicken Duxelle Roulade, Baked Cod Fish with fennel confit and saffron sauce, Confit Duck Leg with mashed potato and Boston Lobster Risotto with diced asparagus. Our top picks are the tender Chargrilled Iberico Pork Loin, the tastefully done Baked Cod Fish, Braised Beef Cheek and the only cappuccino I fancy – Cep Mushroom Truffle Cappucinno! If you love your cheese and cold meats, you will love the Charcuterie & Cheese Room right at the entrance, a chilled room where you can get access to. Another highlight for me is the Egg Station, which dishes out the usual crowd’s favourites like Eggs Benedict and Eggs Cocotte. For some quality meats, there is the live Carving Station with options such as Slow Baked Norwegian Salmon Fillet and Roast Beef, one of the better quality carving station I have come across lately. The fresh Norwegian salmon was a delight to have, while the roast beef was characterised by its tender texture and rich flavour. The seafood selection here is not wide, but you will still get your Boston lobster and oysters, just not four or six different types of oysters. Other highlights include the Caviar station, Salads, chilled appetisers, soups and charcoal grill which dishes out freshly baked pizzas. I usually skip most items at the dessert station as I am usually too full by then, and I do not have an overly sweet tooth either. However, the quality of the desserts here kept me returning a few times. I love the beautiful artisanal chocolate pralines, the Pistachio tart, Chocolate Opera cake and the live crepe station, which goes well with the ice-cream. Rants I am not used to not seeing a Japanese counter in a buffet, as Ash & Elm tries to stay true to its European theme. Therefore, the spread is not the widest, but at least I feel that it’s quality over quantity here. Will I Return Again? The price tag is definitely on the high end for Sunday Brunch buffet, that is without the free-flow Perrier Jouet Champagne, if I were to compare to other hotels. In terms of quality, Ash & Elm is clearly an above average option if you are seeking quality buffet lines without the need to try 101 items. S$98++, inclusive of free-flow juices, soft drinks and DIY Bloody Mary cocktails. S$138++ with unlimited Perrier Jouet Champagne, select wines and beers in addition to the juices and DIY Bloody Mary cocktails. Make your reservation instantly at Ash & Elm here.